From the outside, The Atlas Cafe looks like any other modest-sized house in College Place. The forest green siding, the clean white trim edging the windows and door frame and a few unassuming shrubs do not call out for attention, and the cafe’s neon red “open” sign could easily be overlooked by the casual passerby. Take a step through the unremarkable front door, however, and you quickly realize you are in no run of the mill establishment. 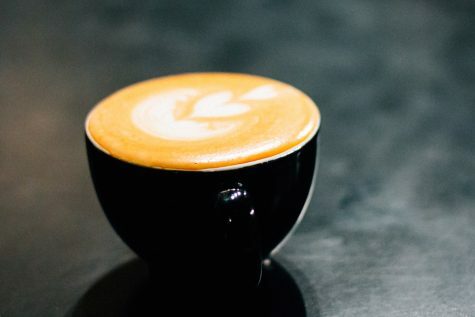 You have entered the home of Walla Walla University’s entirely student-run coffee shop, where a crew of ten baristas, an assistant manager and a student manager serve up some of the best coffee in Walla Walla. As the cafe’s student manager and WWU sophomore Jonathan Fitch explained to me, more than a few WWU students consider the coffee shop the heart of campus. Students use the space to both socialize and study in a comfortable, inviting atmosphere. Fitch applied for and received the position of barista at The Atlas at the end of his senior year of high school and spent his first year at WWU making drinks behind bar. Fitch originally applied to work at The Atlas because of his interest in the crossroads between the art and science of coffee. As student manager, Fitch is responsible for the day to day processes that keep The Atlas running. 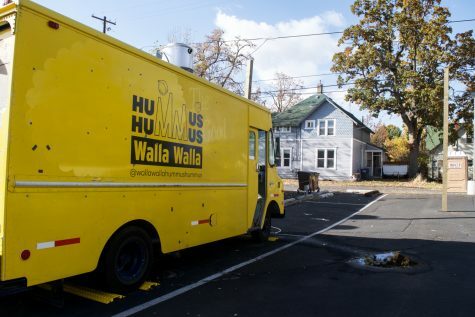 This includes developing the cafe’s budget with the university’s student governing body (ASWWU), which funds The Atlas, and placing bulk and smaller, weekly orders of supplies. The cafe strives to source many ingredients locally, purchasing milk from Andy’s Market in College Place and beans from the Walla Walla Roastery. Fitch explains that his position as student manager is an entirely new way of thinking about The Atlas. Over time, the cafe community has come to be Fitch’s favorite part. First-year WWU student, Carlos Rodriguez said he comes to The Atlas almost every day. What brings Rodriguez back to The Atlas each day? For one, he said he has made almost all of his friends through the cafe. Furthermore, the baristas cultivate an inviting, friendly atmosphere that is difficult to resist. 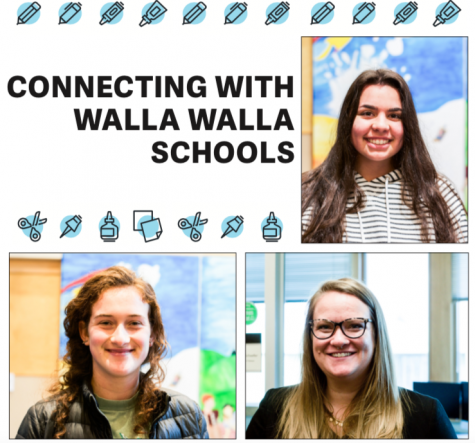 WWU senior, Madison Reeves explained that The Atlas provides a place to pull together all of her friends from around campus who otherwise might not see each other. “There’s not really another good place for us to meet that’s comfortable and that we feel at home in. So that’s what The Atlas does for us,” Reeves said. According to Fitch, the Students Missions Program at WWU is a pretty big focus. Every year dozens of students travel around the globe to be student missionaries for a period of time-half a year, a year or more. 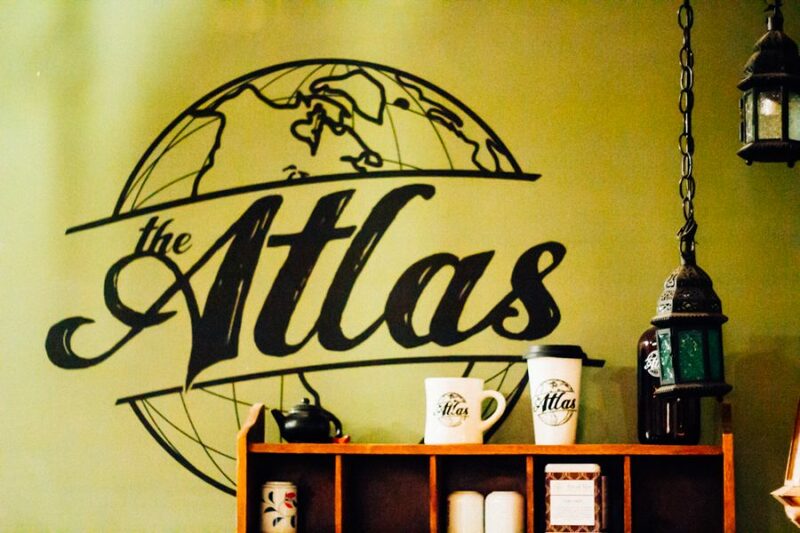 For the student missionaries of WWU, The Atlas is a place to return to and share the life-changing experiences of their time away. 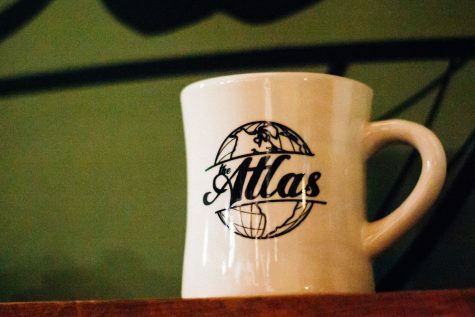 “So the Atlas, the name and the designed theme, kind of that eclectic, rustic design ideology, was crafted around that idea of global service, the student missions program and then kind of as a place for student missionaries to come back and tell their stories,” Fitch said. Near the door leading to the patio, The Atlas provides a list of names and photographs of current student missionaries so other students can write letters to their friends around the globe. 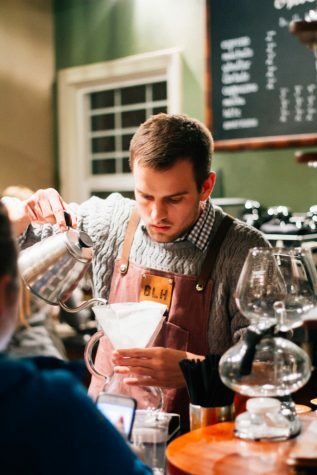 WWU senior and Atlas Cafe barista Brennan Hoenes claims his affinity for coffee began at first taste-with a sip of his parents coffee at age one and a half. Since then, his love for java has only grown. Although Hoenes frequented the Atlas throughout his years at WWU, he decided to submit an application at the end of his junior year. 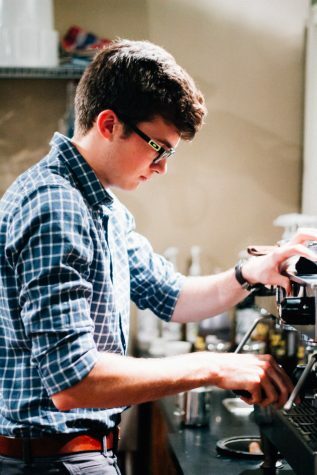 He started working as a barista at the start of this academic year. Hoenes brought with him knowledge of coffee from an array of perspectives. In 2013-2014, Hoenes spent seven months in Africa, during which he visited tea and coffee plantations in Malawi and gained an understanding of the drinks from the grower level. He also spent a month in South Africa visiting cafes who use coffee to promote humanitarian efforts. “Using coffee as a conduit for justice in that regard, sort of inspired me, got me thinking,” Hoenes said. To understand the coffee culture of cafes closer to home, Hoenes spent this summer re-exploring his hometown of Los Angeles through the lens of coffee trying over 60 cups of coffee. Specifically, Hoenes sought to examine the ‘third wave’ of coffee, which he defined as the current iteration of caring. “[It] focuses on the beans and their origins [and] the people that work with the beans, so oftentimes it’s farmer to roaster direct trade, fair trade, and going beyond that, ultimately third wave coffee is committed to roasting in a way that honors the bean more than it honors whatever the roaster wants to make the bean taste like,” Hoenes said. Hoenes explained third wave coffee is pricy, but because The Atlas receives funding from ASWWU, they are able to avoid some of the added costs associated with brewing a better, more ethical cup. Hoenes’s explorations of coffee have fueled his desire to improve his craft. “So many things in life correlate with the law of diminishing returns. At some point what you’re putting in just isn’t giving you anything out, and coffee seems to not be that…for every ounce of myself that I’m willing to give to coffee, it gives back in quality of the cup. So I love that there’s such a direct correlation between effort and result,” Hoenes said. He isn’t sure if he’ll ever reach perfection, but he’ll keep trying. Recently, Fitch and several baristas from The Atlas set up a table in front of Whitman’s library and gave out free samples of their cold brew coffee. Fitch explained that the visit was part of the cafe’s efforts to reach out to the other colleges in the area and promote inter-collegiate collaboration. Fitch stated a lot of WWU students use Whitman’s library to study, and they want to return the favor by inviting Whitman students to The Atlas. “We want to let the Whitman students know that they are more than welcome at our place. They don’t even have to buy drinks of course, but just to use the space as a place to study or to meet new people,” Fitch said. Whitman senior Emma Massie started going to The Atlas this semester. She goes there to study and meet up with her friend from WWU. Massie feels students from both colleges would benefit from each other’s perspectives. While thus far there has been very little collaboration between WWU, Whitman and Walla Walla Community College, Fitch hopes The Atlas could be a space for interaction. “I’m hoping that this can kind of jumpstart a little bit of that, to start talking and start planning events together or working together more. I don’t see why that doesn’t happen,” Fitch said.